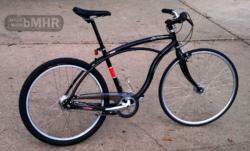 This fast urban hot rod allows a good looking graceful ride. Navigating the city with this custom exploration tool requires certain accessories. She is sly with her color and camouflage. The magenta letters and pink wheels go nicely with the dark purple metallic paint. 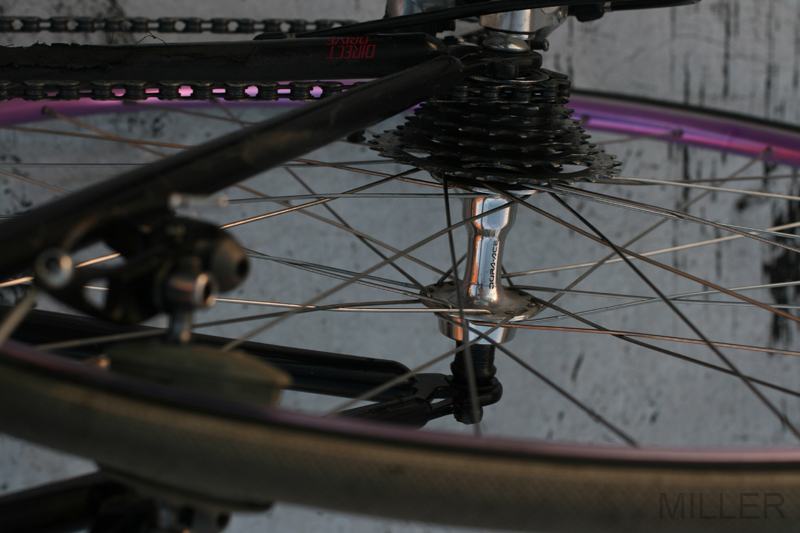 Dura Ace hubs and double butted spokes to Sun rims with Primo tires. 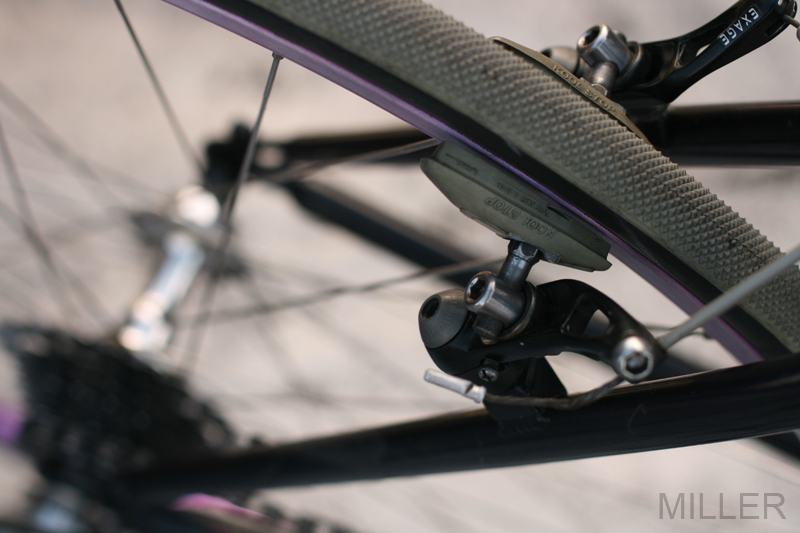 Also to be seen: Kool Stop brake pads and the custom hyperglide cassette. 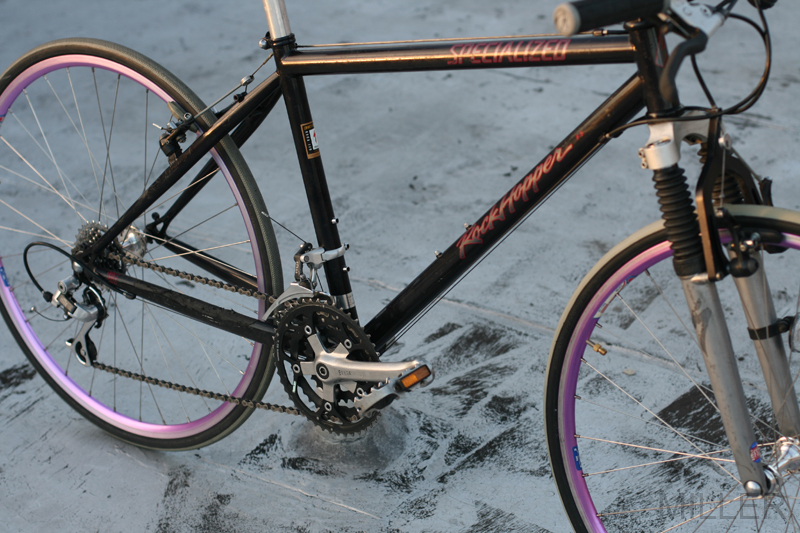 Plus the drivetrain is super hot. Those top of the line racing Dura Ace hubs are so fine. 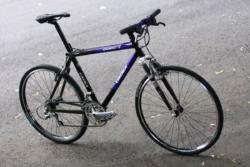 The rear one has a longer axle and extra spacers to fit the mountain bike frame. 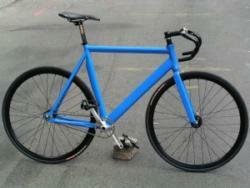 It holds a 9 speed but she uses a custom 7 speed; a tight racing set with a changed-out lower low gear – 26. 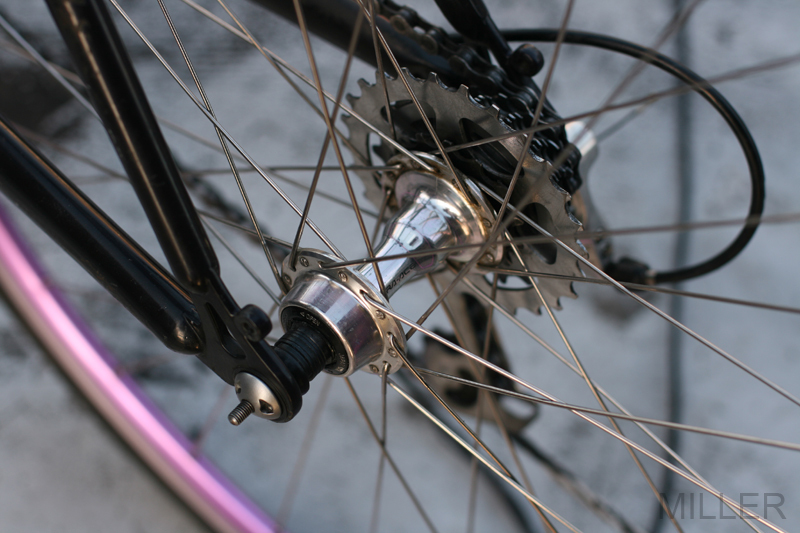 Butted spokes hold on the USA made Sun rims. Those are 100psi wheelchair tires with the gray tread. 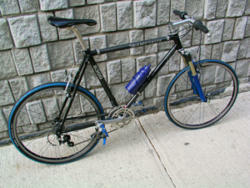 Get on this Rock Hopper, ride fast. A sealed bottom bracket cartridge, metal pedal cages, and gray Kool Stop brake pads round out the performance enhancements. 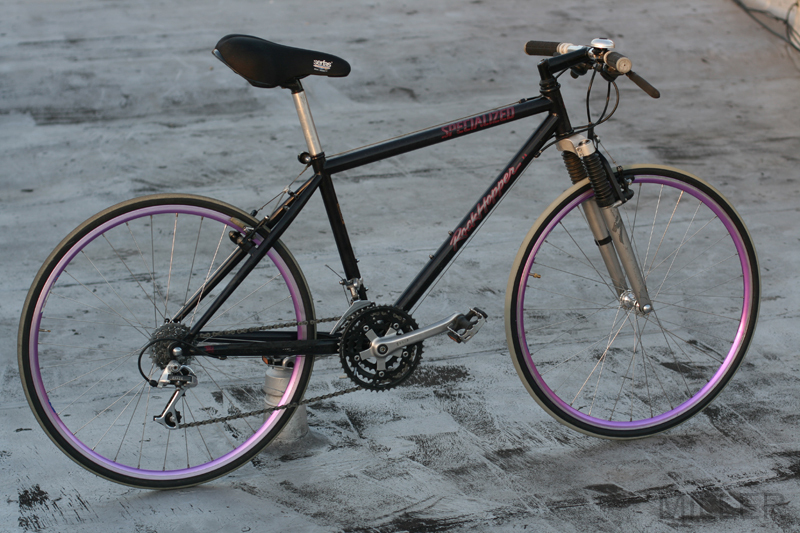 The frame is a fine chromoly steel Specialized Rockhopper, it has the FS Future Shock front suspension air fork. 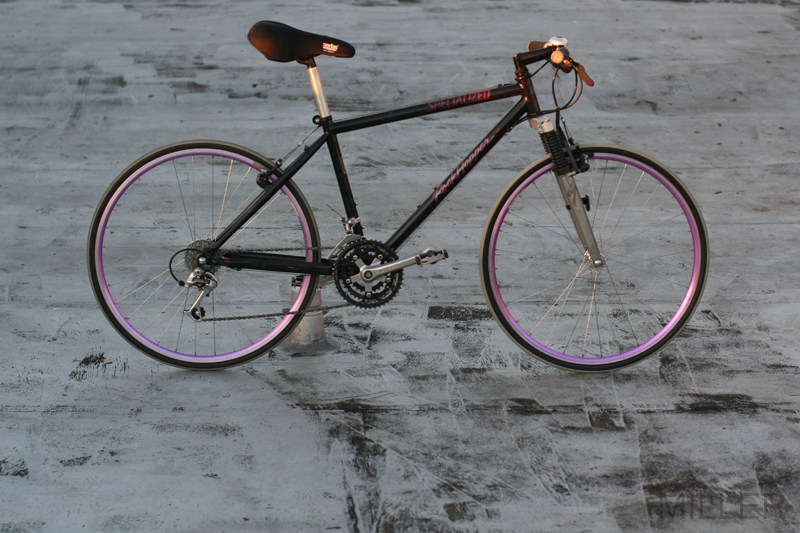 Locking skewers all around allow the lady to ride comfortably and park in the city. The high performance allows her to ride fast confidently. 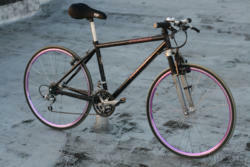 The locking axle skewers make city street riding much more practical.